Designed for use with various types of refrigerants, Model 1785-HVAC/R manifold pressure gauges are available in several ranges including R-12, R-22, R-502, R-134A, and R-410A. 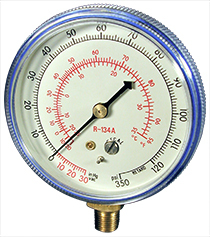 The gauges can be permanently mounted in cooling systems, or used on portable manifolds. The Type CR-1780 is supplied with a 350 psi retard scale to accommodate accidental over-pressure. All gauges make use of a unique, removable, one-piece threaded plastic ring and window to allow quick, easy access to the pointer’s internal adjusting screw. These accurate, sturdy refrigerant gauges are available in English, dual scale, and metric-only ranges.